I have tried so many recipes for homemade corn muffins and they all disappointed. I tried the Jiffy Corn Muffin Mix with Yellow cake mix - You might as well just bake a cake. Ina Garten's recipe was a total flop. This recipe, in my opinion, is the best one I have come across. I was trying to find a "bakery style" muffin that we used to get at a small restaurant we used to go to for lunch. They would toast a large corn muffin on the griddle and serve with grape jelly. This is the way I toast my corn muffins. 1 cup yellow cornmeal 1-1/4 cups buttermilk 1/4 cup heavy cream 1-1/4 cups flour 1-1/2 tsp. baking powder 1 tsp. baking soda 1 tsp. salt 1/2 cup sugar 1 egg 5-1/2 Tbsp. unsalted butter, melted and cooled. Preheat oven to 400 degrees F. Have ready 12 greased or paper-lined muffin cups or 6 large. In a large bowl, combine the buttermilk, cream and cornmeal; set aside. In another bowl, combine the flour, baking powder, baking soda, salt and sugar. Whisk together the egg and melted butter; add to the cornmeal mixture and mix well. Combine with the flour mixture just until combined. Do not overmix. Fill prepared muffin cups 2/3 full. Bake 20 to 25 minutes for large muffins; 15 minutes for regular size. That's just how I like to eat my muffins (no jelly, please). I'm pinning this to make soon. 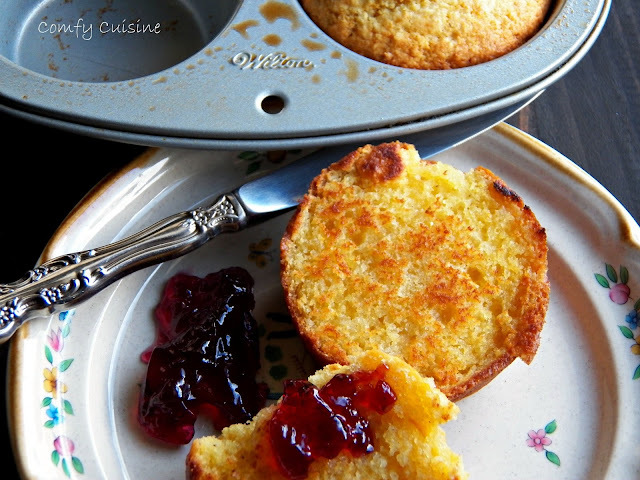 Sounds like a great muffin-and yep, I'll try the jelly please:@) There is nothing like toasting your corn muffins on a cast iron skillet or griddle!